Need a custom quote ? Complete overhaul and many upgrades on some of our small presses. In additon, a purchase of a new numbering press for all of our laser cheque printing.Our small press department is still growing ! Jonarts expands its warehouse space by 8,000 sq. feet to be able to store more paper.In addition, this space will be used for fulfilment and direct mail, a growing segment of our business. Jonarts invests in a new perfect binder and installs the 1st automated and unique case-making machine in Canada. This allowed us to offer specialty custom boxes and case bound books. Overlooking our new 2 Color Press which replaces our old GTO press. At the same time, our digital department doubles in size. The Great Recession which started in late 2000 was a period of general economic decline observed in world markets and lasted up to the early 2010. Despite these economic situations, Jonarts moves forward with one of the largest expansions and investments in its history by moving to its new 20,000 sq. ft. facility and purchases all new equipment at once.! Aris and Nick (dad) one last time in front of the press before the removal of our genuine printing press. Im confident it will satisfy the new owners in south america. Bernard, Tri and Aris with the Heidelberg Printmaster press. One last moment with the press that produced 1000's of exceptional jobs. Both their efforts, dedication and hard work allowed us to move to the next level.True Craftsmen ! Jonarts purchases a Chemichal free computer to plate (CTP) machine. 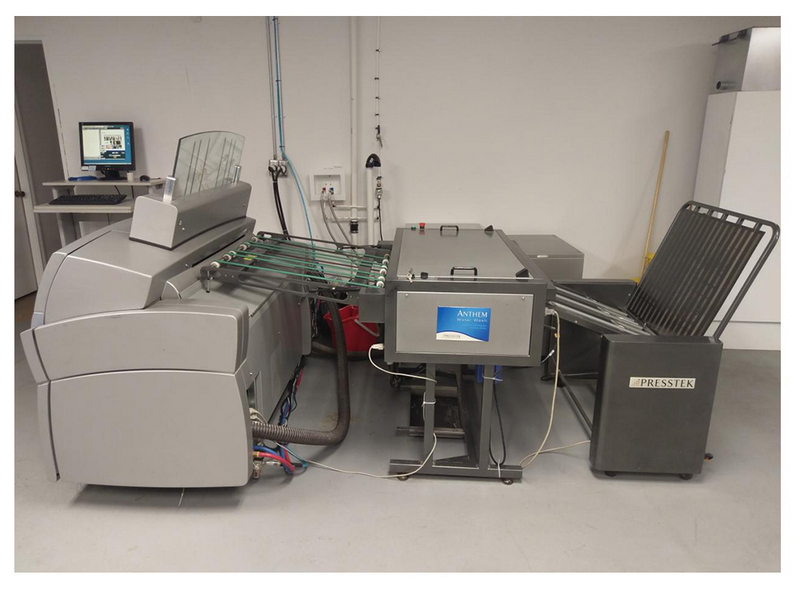 Our new equipment allowed us to eliminate all chemichals related to imaging plates for our presses and to take our first steps in moving forward to an eco-friendly environment. John looking to venture in the web printing. A growing segment of the print industry at the time. Aris traveling in England visiting 2 major dealers in order to finalize a purchase of a new Heidelberg press. We are all very excited and overlooking our new heidelberg press. Exceptional print quality can now be offered to our clients. Bernard, our loyal pressman for over 24 years brings us all his experience from Europe and Montreal and ensures that all print jobs are perfect. A true craftsman with the highest standards we have ever seen in the industry.We love him dearly and are blessed to have him part of our family, even until today ! Aris and John visiting the print show at the McCormick Place in Chicago, Illinois.Looking to purchase new equipment and technologies to move the company to the next level. A new division is created named Jonarts. is graphic design and prepress. Nick, on a regular day at work running the printing presses and guillotine. As always, errorless, focused and very productive.